The Adamawa Fulani are a vast people group that migrated from North Africa or the Middle East to West and Central Africa centuries ago. They are nomadic shepherds who travel with their herds in search of better grazing land. Confined to an almost horizontal area across Africa, they are bound by the Sahara Desert to the north and by the cattle-attracted tsetse fly to the south. In addition to keeping flocks, some Adamawa Fulani are farmers and some have become scholars and influential leaders. Today, they are grouped and named according to location, occupation, and dialect. 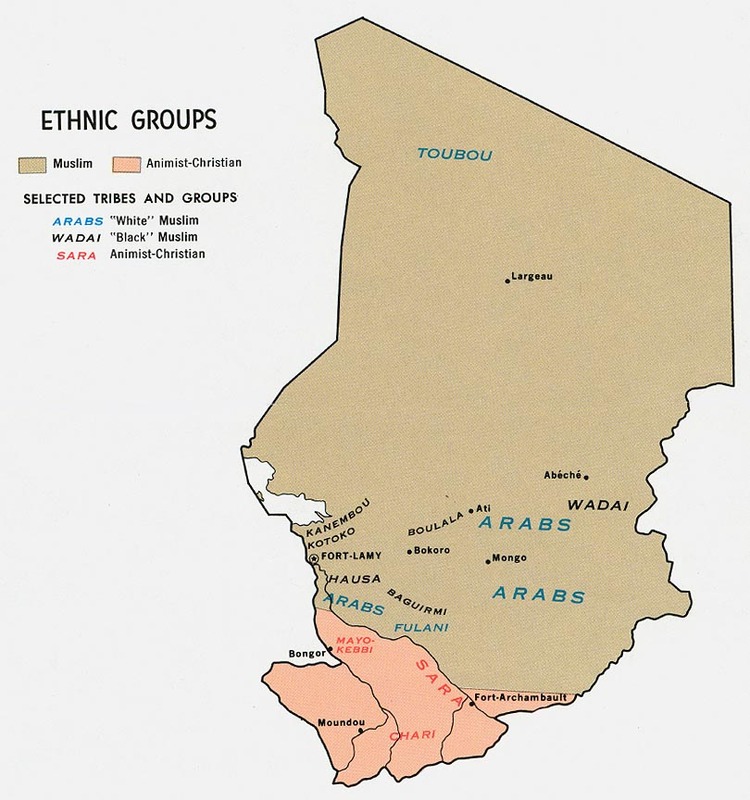 The Adamawa Fulani of Chad are a branch of the Fulani who occupy the Adamawa province of Nigeria and have spilled over into Cameroon and Chad. Their language is called Fulfulde. They are lighter-skinned and have thinner lips and straighter hair and noses than other African groups with whom they dwell, suggesting a Caucasian origin. Although most Adamawa Fulani are shepherds, some are farmers who grow sorghum or corn. They obtain millet, yams, and peanuts by trading with nearby tribes. Milk is a main source of the Adamawa Fulani diet, and the people also produce and trade butter in the markets. Adamawa Fulani have dry-season and wet-season camps. They live in the wet-season camps during cultivation and harvest times, when the pastures are best for grazing. Homes are beehive huts made of woven twigs, leaves, and grass. During the dry season, the people camp in portable huts, moving the cattle or sheep herds to well-watered land in the flood plains. Men hunt, trade livestock, and are in charge of herding. Women usually milk the cattle and sell butter. Young men move the herds, with the help of their younger brothers. Elders make all political decisions and also teach traditions to the children. Children learn from an early age to have the dignity and pride that all Adamawa Fulani seem to possess. A boy who has been initiated into manhood will live in a separate hut which eventually will be the home for his fiance. Marriages usually are arranged by parents during a child's infancy. According to Muslim tradition, men may marry up to four wives. Children are considered extremely important. Adamawa Fulani believe a person lives from generation to generation through his children. If an Adamawa Fulani dies having never had children, he is believed to have died twice. A true Adamawa Fulani is psychologically and physically distant and distinct from a non-Fulani. An Adamawa Fulani will hold in his emotions so that no one knows what he is thinking. The ideal Adamawa Fulani is reserved, yet emotionally tied to his cattle. He is gentle, yet disdainful toward non-Fulani. The great majority of the Adamawa Fulani are Muslim; however, like other Fulani sects, the Adamawa Fulani adhere to traditional practices and beliefs other than Islam. For example, taboos are common in their culture: they may not call a first son or daughter by name; a wife is to be seen at a distance from her husband in public; goat meat may not be eaten. Adamawa Fulani are required to love their mothers and respect their elders. They posses many virtues, such as generosity, honesty, and modesty. Adamawa Fulani boys are initiated into manhood in an unusual manner. Friends must beat each other across the chests with walking sticks. No sign of pain must by shown, and the scars from the beatings are to be proudly shown as a sign of courage throughout the men's lives. A large effort has been made to evangelize these reserved people; however, few of the Adamawa Fulani have become Christians. They need much prayer, intercession, and further evangelization so they may be reached with the Gospel message. * Scripture Prayers for the Fulani, Adamawa in Chad. * Ask the Lord to send laborers with servants' hearts to work among the Adamawa Fulani. * Ask the Holy Spirit to grant wisdom and favor to any missions agencies focusing on the Adamawa Fulani. * Pray for effectiveness of the Jesus film among the people. * Pray that God will give Adamawa Fulani believers boldness to share the love of Jesus with their own people. * Ask the Lord to bring forth a strong and growing Adamawa Fulani church for the glory of His name!